Proof that the apple doesn’t fall far from the tree. 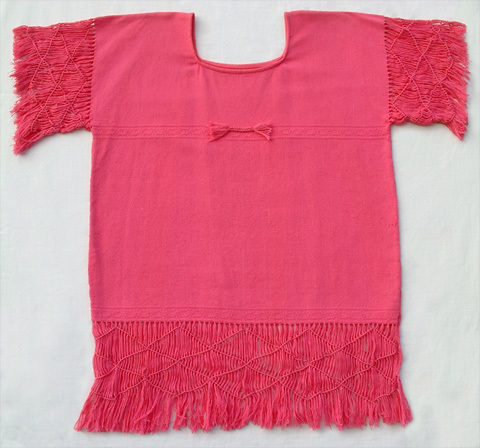 This beautiful woven macrame blouse from Mexico was in my mother’s collection of vintage apparel (otherwise known as her wardrobe). Mom’s not really sure when it was given to her (hey she’s 87), sometime in the late 50’s, or more probably early 60’s. She does remember vividly who gave it to her, an elderly family friend named Mr. Dafoe. Interestingly, it is constructed from one long woven piece of fabric that is folded in half and stiched at the side seams, so there are no shoulder seams. Really interesting is that as I was thumbing through my all time favorite The Macrame Book by Helen Bress, I spotted the exact same style of blouse on page 111.